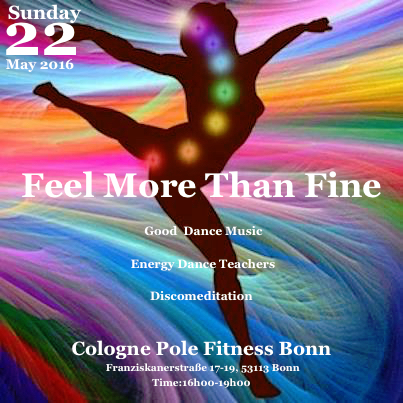 Feel More Than Fine are Healthy Dance Events thriving in bringing people together with the intention to raise the vibrations on ecstatic beats and with the intelligent use of The Mind/Body/Spirit Complex through Dancing. Purified Water or maybe just Divine Love is all is needed! And Dancing is the best form of Meditation! Our next event takes places in Bonn,Germany on May 22nd,2016. Absolutely no need to use alcohol or drugs to get high.As a matter of fact these substances are attracting entities in our auric field,creating negativity on the environment of the person who makes such choice.Free will is ours and nobody can interfere for our well being except ourself.Watch here this 10′ video explaining the spiritual effects of alcohol with a scientific proof. Here few of our events involving Yoga and Acro Yoga.